by function, effects of deficiency, effects of excess, requirements and sources. Functions: Use for carbohydrate metabolisms, digestion, normal function of striated muscles, cardiac muscle and nervous systems. Effects of deficiency: Lost of strength of the quadriceps muscle; loss of vibration sense: first of the toes and later of the malleoli [ankle] and tibias. Tenderness of the calves and hyperesthesia of the feet. Diminution and loss of the Achilles tendon and patellar reflexes first, in the stage of polyneuritis of “dry beriberi". Edema of the shins, ankles and knee joints, found in “wet beriberi”. Enlarged heart with dependent edema and elevated venous pressures: poor response to rest and administration of digitalis unless thiamine is given. This is the late manifestation of severe deficiency [beriberi heart]. Treatment: 50 mg twice daily until relief of symptoms. Effects of excess: No case reported, high doses are excreted by the kidney. Requirements: 1.5 mg per day. Sources: Liver, whole grains, unrefined cereal grains, yeast. Functions: Constituent of flavor-proteins, helps body release energy from protein, carbohydrates and fat metabolism. Figure 1: Photophobia,epiphora and scleral injection in riboflavin deficiency. Effects of deficiency: Photophobia, epiphora and scleral injection. Cheilitis: Excessive and irregular wrinkling of the lips. 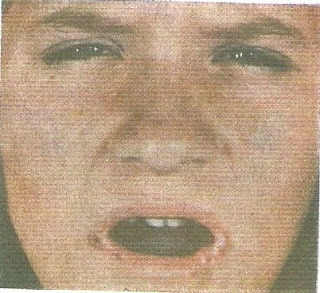 Angular stomatitis, various combinations of erythema [redness] and open fissuring in the angles of the mouth .Magenta tongue: A purplish red coloring with moderate edema and flattening of fili-form papillae. Treatment: 5 mg three times daily for weeks. Sources: Liver, milk, whole grains, eggs, yeast and green leafy vegetables. Fig. 2: Cheilitis and photophobia in riboflafin deficiency. VITAMIN B3 [NIACIN,NICOTINIC ACID] . Functions: As a constituent of coenzyme for carbohydrate, protein and fat metabolism. It is also has cholesterol lowering effects. 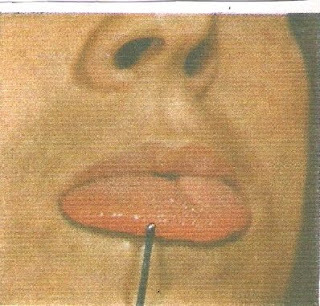 Effects of deficiency: Glossitis: edema of the tongue, shown by dental indentation. Increase redness of the tongue: Scarlet red in severe acute deficiency, beefy red in chronic states. Congestion and hypertrophy of papillae of the tongue, followed by fusion and atrophy. 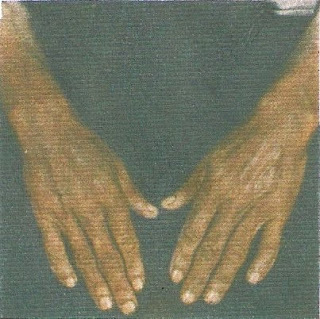 Pellagrous dermatitis: Erythema [redness], rough scaling with ulceration and formation of bullae [ bag of plasma], affecting primarily areas of the skin exposed to light; namely wrists, calf, ankles, neck and face; observed in severe deficiency [pellagra[, and frequently associated with diarrhea and dementia. Treatment: Acute deficiency state: 100 mg niacin-amide twice daily for weeks, chronic state: 100 mg of niacin-amide twice daily over a prolonged period. Sources: Meat, dairy products, poultry eggs, peanuts, fish.